A journal introduces projects through its graphic, photographic or written representations. But this exercise can also be understood as a project in itself, through which the journal offers a way of seeing and interpreting architecture. We present here cases in which ARQ took chances and, in doing so, understood these projects through its own. The invitation to select ten works published in the 99 issues of ARQ, for me, immediately moved the question obliquely: can a magazine be the author or at least the co-author of a work? In other words, how much of the publication itself - as an interpretation or more accurately a specific ‘edition,’ becomes part of the work and its value? When both ‘what’ is published and ‘how’ it is published fall into that critical relationship, it seems important to expand the criteria to include (at least implicitly) the ways of publishing: the following list includes both architectural buildings and texts, as well as sets of these, assumed in its time by the editor as a unit. For all of them, the way in which the content was published is crucial for understanding their scope today, and both - form and content - are confused, ambiguous and intertwined. All of them are first stones: some carefully laid, others cast with energy. Figure 1 Bar en Bellavista. Luis Morales, Alberto Mozó, 1991. 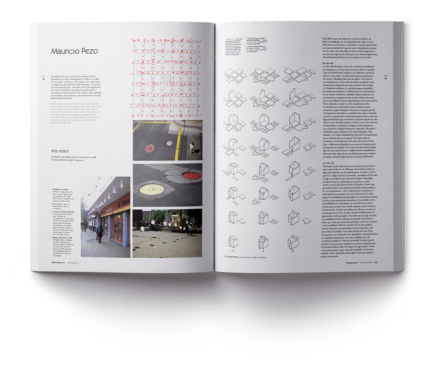 Ten years after its first edition, in September 1991, ARQ published its issue number 18 exhibiting two features that would mark its editorial line during an major portion of the following decade: the progressive inclusion of foreign architects in its index and the publication of recently graduated students’ work. Among the latter is the bar Manifesto by the students (as the index declares) Alberto Mozó and Luis Morales. 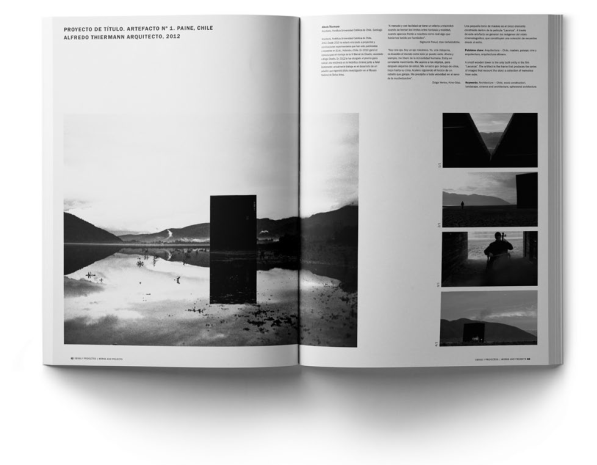 Complemented with a commentary by professor and mathematician Manuel Corrada, the publication of Manifesto (beyond the nostalgia for the optimistic and vital time that came right after the dictatorship) takes a chance by showing the project through its fragments, grouping its photographs as if in comic and thus diluting the hegemonic view of the plan. 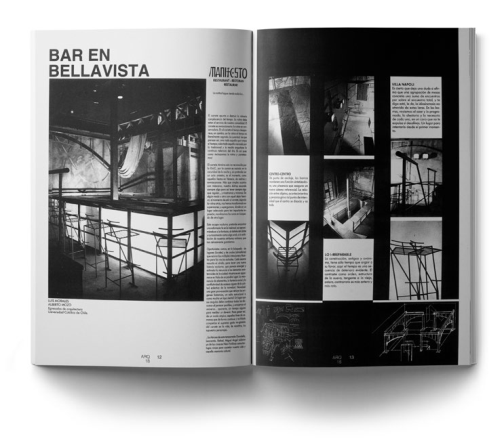 Corrada’s narrative evokes the recovery of Santiago as an escape from boredom, the consolidation of Bellavista neighborhood as one of its main scenarios and casts the image of the bar as a public square: the project built inside an old house by architecture students mirrors the changes of a recovered city. Figure 2 Casa Sagan. Guillermo Jullian, Ann M. Pendleton, 1989. 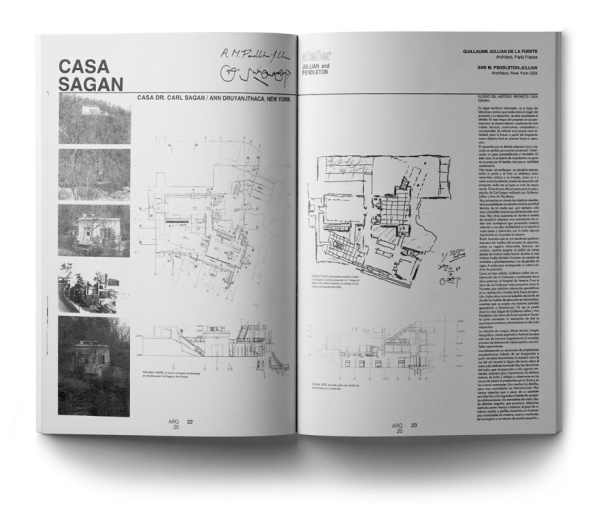 Although strictly speaking this was not its first publication in Chile, the project by Ann Pendleton and Guillermo Jullian for the Sagan house in Ithaca, included in ARQ 20, offers a format for publishing and also one for practice: dense and exhaustive, the project reveals a design method that attempts to cancel unforeseen events, anticipating the building in a 1:1 design with maximum dimension precision. Stairs, on-site furniture, pavements and windows become small buildings that populate lavishly both the pages and the interior space of Carl Sagan and Ann Druyan’ residence. Rodrigo Pérez de Arce’s text sets the coordinates of the project and advances the relationship that Jullian would resume with Chile, little over 10 years later, until his death in Santiago. Figure 3 Casa Klotz. Mathias Klotz, 1990. Figure 4 Casa Melocotón. Ximena García-Huidobro, Sebastián Irarrázaval, Guillermo Acuña, 1990. Devoted to wood, issue 23 could be considered a work in itself. Deposit of the results of a Fondecyt research project on contemporary wood architecture developed by Montserrat Palmer, Eugenio Garcés and Patricio Morgado, the journal insists on publishing recently graduated architects by inclusding three small wood housing projects, starting with the house built by Mathias Klotz two years earlier in Tongoy. 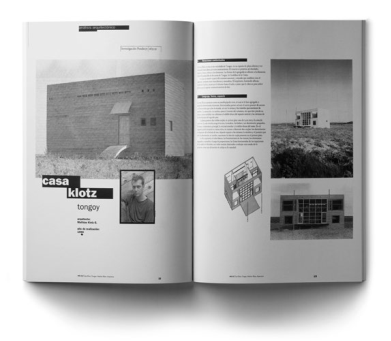 This project as well as the Melocotón house by Sebastián Irarrázaval, Guillermo Acuña and Ximena García Huidobro and the Moller house by Matías González portray both the ‘beach house phenomenon’ as the main laboratory of Chilean architecture in the nineties as well as the commitment of the editor with younger generations. Figure 5 Ejercicios de descripción. Smiljan Radić, Giorgio Mastinu, Flavio Zanon, Nikolas Skutelis, Manuel Corrada, Alejandro Aravena, 1994. 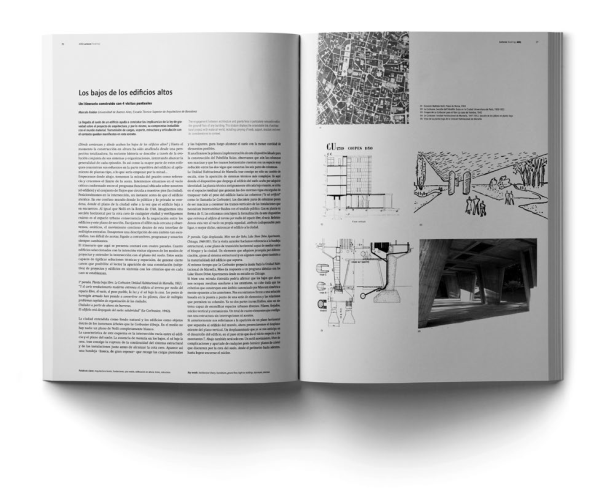 Published in ARQ 27, the five description exercises by Smiljan Radić, Giorgio Mastinu, Flavio Zanon, Nikolas Skutelis and Manuel Corrada, followed Alejandro Aravena’s notes on his visit to the Alhambra, signal the magazine’s growing appreciation for the texts by architects. The productive tension between the publishing of built works versus projects and essays, annotations and more recently research marked much of ARQ’s maturity as a journal. The inclusion of the writings cited above accompanied by small images of Chatwin, Morandi, Turner and Hockney, among other authors, give an account of the expansion of the architectural field that ARQ set out to promote. Figure 6 Lina Bo Bardi. Lina Bo Bardi, 1977. The role that ARQ had, especially during the turn of the century, regarding the installation of local authors in the international field is frequently discussed. The opposite process was certainly less intense, but equally relevant. 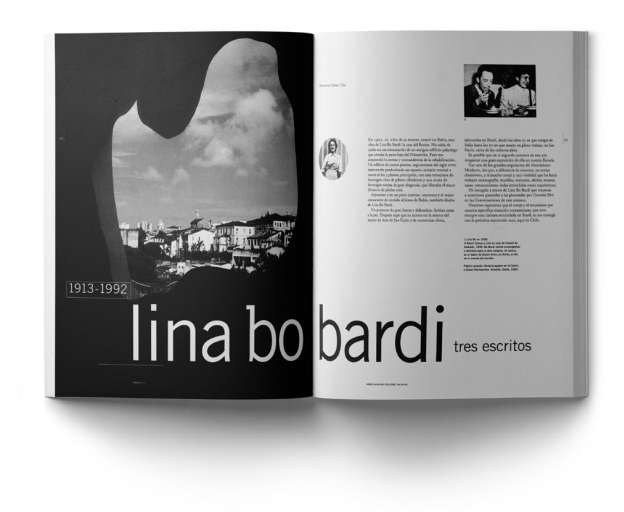 The publishing of Lina Bo Bardi’s texts in ARQ 32, accompanied by a small import of copies of a monograph edited in Brazil two years earlier, were fundamental actions in the dissemination of Bo Bardi’s work and thought in Santiago. Until then virtually unknown in Chile, the images of some of her designs and works in Bahía and São Paulo plus “Tiempos de Abundancia,” “Lo Bello y el Derecho a lo Feo,” and a text for the exhibition of popular constructions at the sesc Pompéia quickly sparked the interest of students and architects. Figure 7 El museo Guggenheim de Bilbao. Observaciones en torno al emplazamiento. Frank Gehry, 1999. 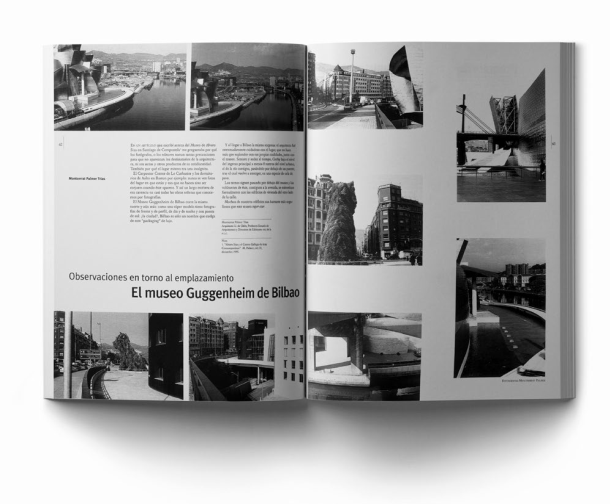 Anticipating the wishes of the German editor and critic Andreas Ruby,2 Montserrat Palmer introduces in ARQ 41 Frank Gehry’s Guggenheim Museum in Bilbao in an unusual and sharp way: using her own photos. The issue does not insist on looking at the building but rather shows the city of Bilbao from the museum, dismantling thus the condition of ‘object building’ - as the project was featured - by revealing the particularities of its location regarding the street and the neighborhood where it is implanted. Beyond the well-known urban branding, the position of the building in the city suggests relationships and spatial links that constitute a project in itself. Figure 8 Eduardo Castillo, Mauricio Pezo, 2002. ARQ 51 - El Sur de América (The South of America) resumes the effort to introduce new characters in the disciplinary discussion. 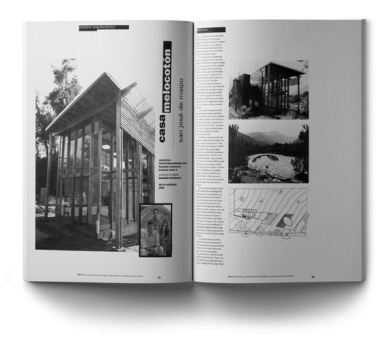 Along with Gerardo Caballero, Rafael Iglesia, Solano Benítez and the Brazilians MMBB, the issue includes the first buildings of two graduates linked in different ways to the city of Concepción: Mauricio Pezo and Eduardo Castillo, who by then already designed the Gallinero house that would be built and published in ARQ several years later. Figure 9 Los bajos de los edificios altos. Marcelo Faiden, 2006. 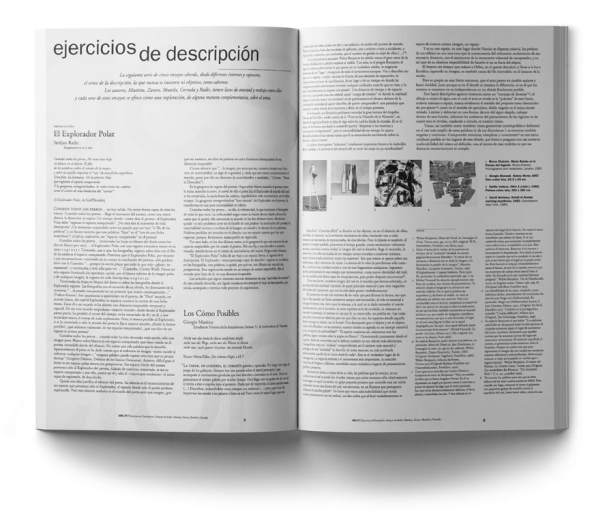 Before Ediciones ARQ published the first monographic book by Adamo Faiden in 2009, Marcelo Faiden advanced in Chile “Los bajos de los edificios altos”, a text that appeared in ARQ 63 as a preview of his doctoral thesis, which was presented in Barcelona in 2015. Discussion on how high-rise buildings are capable of generating urban realities in the way they touch the ground portrays Faiden’s biography in Buenos Aires and, in retrospect, offers a few hints on the work of one of the Argentinian architecture studios that have had more recognition outside their country. Figure 10 Artefacto Nº1 / Proyecto de título. Alfredo Thiermann (Profesor guía: Rodrigo Pérez de Arce), 2012. A wooden structure built in a dry lagoon as the backdrop for a film is what that Alfredo Thiermann presented in 2012 as a graduation project at the School of Architecture of the Pontificia Universidad Católica. It was that circulated in ARQ 83 following the tradition of the first magazines published during the eighties. In addition to introducing a new architect, the project is installed in a blurred area between landscaping, design and architecture in line with debates on the current nature of the graduation project, its disciplinary scope and possible crossings with the extra-academic field. Figure 11 Moom. Kazujiro Kojima, 2011. ARQ 87 includes in its index a delicate tensegrity structure that Kojima builds as an academic exercise with students from Tokyo University of Sciences, accounting for the incipient proximity between Japanese and Chilean architecture. Constructed with a plastic textile membrane and aluminum bars, Moom looks once again at lightweight and cheap, removable and reusable structures, approaching the work of Fuller or Snelson from a different angle; the project is introduced from its engineering plans. 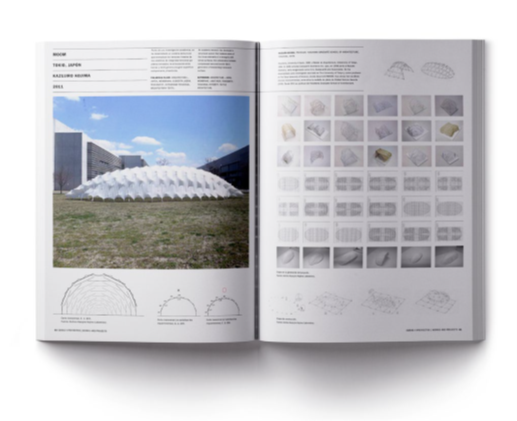 Is that the same impulse that encouraged Claudio Torres S., Yuji Harada, Emile Straub E. and Clarita Reutter in the research on tensed structures and the subsequent erection of a dome in the 2017 version of the Young Architects Program in Chile? Architect, Pontificia Universidad Católica de Chile (1999), Art Studies at the same University (1993). Was director of Ediciones ARQ between 2011 and 2015. Has developed editorial and curatorial projects on contemporary Chilean architecture in collaboration with magazines such as Icon (England), Mark (Holland), Dwell (USA ), 2G (Spain), The Plan (Italy), AU (Brazil), Casabella (Italy), Azure (Canada), Oris (Croatia), among others. His works include the SLGM Documentation Center Library at the School of Architecture UC (together with Cecilia Puga, 2007), the new Crypt for the Metropolitan Cathedral of Santiago (associated with Rodrigo Pérez de Arce and Sebastián Bianchi, 2006). Together with Cecilia Puga and Paula Velasco, he was awarded first prize at the competitions for the public use infrastructure at the Queulat National Park in Aysén (2016) and Punta Arenas Cruise Terminal (2017). He is currently a professor at the Universidad Andrés Bello and the Pontificia Universidad Católica de Chile and is a board member of Fundación de Arquitectura Frágil in Santiago.